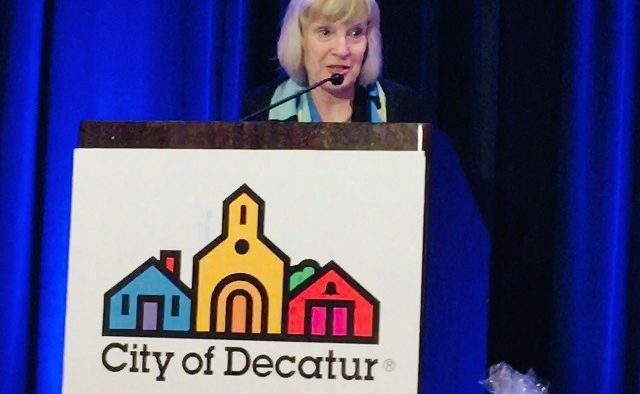 The Decatur Business Association held its “State of the City” meeting February 5, 2019, at the Courtyard by Marriott Conference Center in downtown Decatur. City Schools of Decatur Board Chair Lewis Jones spoke on the state of the schools while Mayor Patti Garrett spoke on the state of the city. The Thomas O. Davis Public Service Award was given to Corey Bivens, Family and Youth Advisor for the City of Decatur Housing Authority. After praising the academic preparation, career training, and extracurricular opportunities available to students in the Decatur school system, Jones acknowledged, “issues and challenges that we are trying to address” including the question of racial inequality. Jones also spoke of the challenges presented by rapid growth of the City Schools of Decatur system over the past 10 years and the recent and ongoing expansions to meet that need, including construction of a new elementary school on Talley Street. Mayor Garrett discussed city planning, transportation, development, public art and the health of the Decatur downtown business district. According to Garrett, business vacancies in the downtown corridor are at 3 percent, while the national average is 10 percent. Seventy percent of downtown businesses are “indie type” that is non-corporate. “While we hate to lose any business, we know that turnover is normal,” she said. Garrett also addressed parking concerns, citing over 10,000 parking spaces in downtown Decatur. According to Garrett, budget priorities are based on the plan and 93 percent of the tasks outlined in the 2010 Strategic Plan have been completed. 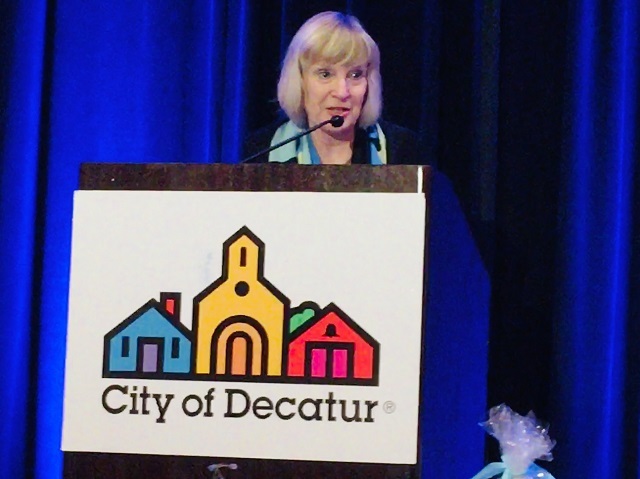 In Nov. 2018, Decatur hosted its first-ever housing summit. Garrett announced the formation of a new citizen-led task force on affordable housing, based on a recommendation by the housing summit participants.